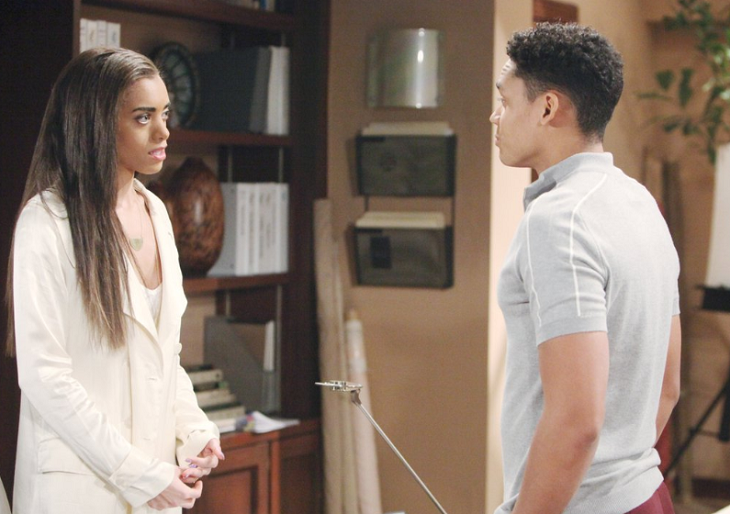 “The Bold and the Beautiful” (BB) recap for Wednesday, April 10, 2019 reveals that over at Spencer Publications, Wyatt Spencer (Darin Brooks) is totally freaked out over the news that Flo Fulton (Katrina Bowden) might be his sister and he wants answers. Bill Spencer (Don Diamont) concedes he was with Shauna Fulton (Denise Richards) once a long time ago. Wyatt bellows, “Who has a kid after one time?” Quinn Forrester (Rena Sofer) mutters it’s not a cumulative process and presses to find out if Wyatt and Flo did anything on prom night. Wyatt won’t go there. He turns to Shauna, who sheepishly says, “I was young, having fun…” They argue about whether to tell Flo. Quinn declares they need a DNA test. Wyatt reveals Flo already did a DNA test. Shauna’s taken aback. Wyatt says she deserves to know who her father is. Bill announces he’s not in any database – it won’t point to him. Wyatt relays if any Spencer is a match to Flo it would prove he’s her father. Suddenly, Wyatt gets an email about the results. At Forrester Creations, B&B’s Flo admits she doesn’t want to be known as Phoebe’s birth mother. Hope Logan Spencer (Annika Noelle) would never want to embarrass her and hopes they can be friends. Flo doesn’t think that’s possible now. Hope can’t understand why not – they were pregnant with their daughters at the same time. She reminds her their circumstances are different. Hope just wants to find the peace Flo seems to have found without her daughter. Flo protests – she’s not as carefree as everyone thinks. Flo takes a call from Wyatt Spencer, who tells her the results are in. She says she’ll look later and admits she’s with Hope before disconnecting. Flo tells Hope a story about Phoebe’s father and explains she and Hope are different. Hope needs to understand why fate took Beth away from her. Flo says it wasn’t fate. AT the Forrester design office, B&B’s Xander Avant (Adain Bradley) kisses Zoe and asks about their spring break trip. Zoe relays she has to go to London herself – sometimes the only place to be is…away. Xander asks what she wants to be far away from, and Zoe explains she and Reese Buckingham (Wayne Brady) have unfinished business. He asks if Reese is in trouble. Zoe won’t get into it but asks him to text her if Hope makes a surprise announcement or takes off for Paris. And that’s a wrap. Don’t forget to check often with Soap Opera Spy for all your soap needs!